Welcome to Serrano Country Club and its Tennis Programs, it's a great place to play. 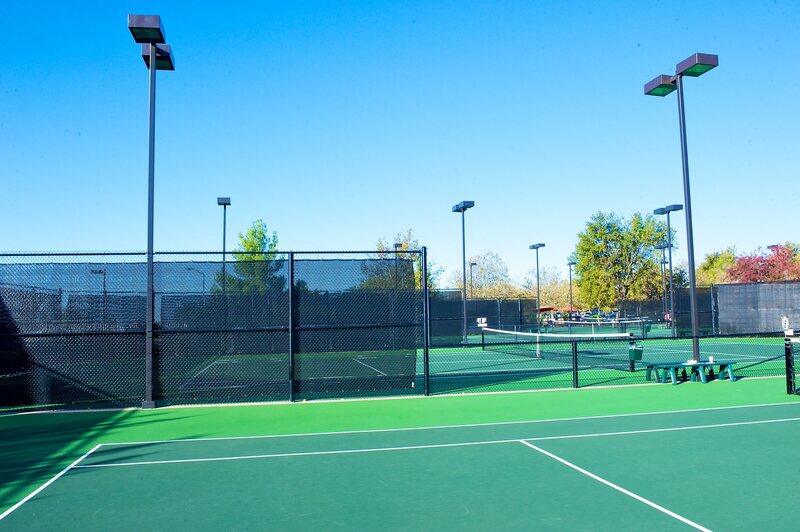 Serrano Country Club's Tennis Department offers ladies group clinics, cardio tennis classes, private lessons, beginner groups, men's work-out classes, play better singles clinics and drop-in classes complemented by our 4 lighted tennis courts for evening play. We also offer many adult and junior social events, USTA, SATA and in-house leagues, and annual Club Championship Tournaments... plus more. Our USPTA certified tennis director and his staff can help you find the best ways to get started in the game of tennis or to get back into it if you've been away for a while. They can also help you fine-tune your game or get you involved with the various leagues and clinics available. In 2019, the Serrano Tennis Department will be offering some new programs to entice Golf players, new members and beginners onto the courts. Complimentary New Member orientations and private lessons- The New Member Orientations are offered to all new members as an introduction to the Tennis Department and its offerings. Learn how to become involved in tennis and its fun programs. Complimentary "Come Try Tennis" clinics and play events for Golf Members- The FREE “Come Try Tennis” events will be run as a 30-minute group lesson clinic followed by a 60 minute social doubles play event. This is a chance to try a new sport that you already have at your club. Adult Beginner Clinics and Socials- These classes are a pathway to improvement & low level competition. Clinics will be offered weekly beginning in Spring with the intent of players becoming comfortable with playing doubles in a social relaxed atmosphere. AFearnside@SerranoCountryClub.com or call at 925. 518-2656. If you are not playing your best, here are some things to try to right the ship before it's too late. Change Tactics: "If it's not broken don't fix it", great saying BUT if it's not working you need to go to game plan B, C & sometimes D but often D stands for doomed. Move Your Feet: The Pros take between 8 and 16 steps between each stroke. Club players often only take 2 or 3. Slow Down Between Points: Never be in a rush to lose. Don't Give it Away: Give them no free points. Make them earn every point. If you lose because the other team is too good, that's ok. But losing because you gave it away hurts. "I am proud of the entire tennis department and know that you will be very satisfied with all the professional services provided and Tennis programming offered here. If you are interested in stepping out on the court with me, I would love to hear from you. For information on lessons and pricing or if you need assistance in deciding which programs, instruction and or activities would be best for you, please feel free to contact me at (925) 518-2656 or e-mail me at Afearnside@serranocountryclub.com. Before arriving at Serrano, Andrew held the position of Tennis Director at the Auburn Racquet & Fitness Club, Livermore Valley Tennis Club, and Natomas Racquet Clubs. He also owned and manged the Fearnside Tennis Academy. Before moving to California, Andrew was the Head Professional, Director of Junior Excellence and Director of Teaching Excellence at the Mid-Town Tennis Club in Chicago. While living in the UK, he was the Head Professional at the Riverside Club in London, England. Andrew has an extensive background in teaching tennis all over the world. While living in Chicago, he was formally a USTA National coach for the Mid-West Section. Andrew has trained over 200 nationally ranked and over 300 sectional ranked junior players, six players with ITF World Junior Rankings (including a former #1 world ranked junior player) and several former and current touring professionals, which includes three Federation Cup Players and one Davis Cup Player. Andrew is an Australian teaching professional who is a former ATP world ranked player. He was formerly a top 5 ranked player for singles and doubles age divisions in the USTA Nor-Cal Section and held USTA National and ITF World Senior Disvion rankings. Andrew holds an Elite Level Certification with the USPTA and holds the USTA High Performance Certification. He also holds a USTA Sport Science Certification and is a USPTA Junior Development Specialist. Andrew is also the USPTA Regional Director for the Sacramento Region.